Lot of people enjoy using either a cruiser or a chopper or any other type of bikes to travel around the country. For them motorcycle camping trailers are the best option which is at the same time much less expensive than renting a room in some motels or hotels. Among many manufacturers producing camping trailers for motorcycles, one name is highlighting – Kwik Kamp. It is a famous name in the camping-trailer world offering a number of varieties and models. Kwik Kamp was a very small company, which ceased production and sales in 1999. Although the company is no longer in business, Kwik Kamp motorcycle camping trailers can still be found on the RV market. Despite the fact that these camping trailers are no longer being produced, they are still highly popular among campers who are riding bikes. Since campers who are riding motorcycles need different equipment for camping then all other campers who can pack their equipment into their cars, Kwik Kamp motorcycle camping trailers provide motorcyclists not only place to store all their necessary gear but also they provide them dry space to sleep during nights. This storage space is also accessible even if the camper is not set up. Kwik Kamp motorcycle camping trailers have a great feature to protect the bike from the weather when the camper is set up. This means that you won't have to worry when your bike is out of the garage and while you are traveling. Another excellent feature of these trailers is that they are incredibly simple and quick to set up. It takes less than five minutes to set up and one person can do it very easily. Kwik Kamp motorcycle camping trailers does not leak and have separate compartments for camper equipment. They are very quality constructed and are made to last long. Thanks to their durability and the fact that they can be very quickly set up, most bikers decide to buy these campers. Among all their advantages over many others, one drawback is being routed. They are slightly heavier than some other brands but taking into account all the benefits that Kwik Kamp motorcycle camping trailers have, they are worth buying. Kwik Kamp motorcycle camping trailers are very small in size but they are designed to meet all the campers' needs and despite the fact that they are no longer on the market and you can't buy a new one they are still well-loved and well-used. So if you are one of many who would like to own a Kwik Kamp motorcycle camping trailers you will have to satisfy with a used option. Camping expeditions or hiking expeditions are always fun. Especially if you are going out for motorcycle camping, things can be even more interesting and fun as reaching the place will not be a difficult thing except for the fact that you need to carry certain essential things which are required while camping. The most important things that you need to carry are the camping gears and equipment. These include the most important things like the sleeping bags, tents, torch and others. These things need to light and you must be capable of carrying things easily. In other others they need to be light weight and small when packed. The Kwik Kamp camping trailers are easy to set up and the entire set up can be completed only within 5 minutes. Only one person can complete the set up easily. They come with the fold down stabilizer jacks on the back and front of the trailer. Amazingly, they come with king size mattresses and they also have large stand up dressing room. 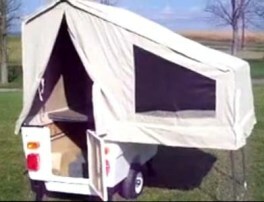 The most interesting feature of these trailers is that they have large awning for hooking up the front top of the camper so that the bike or the motorcycle can be parked under it during the rain. There is a large cooler on the front of the tongue and can be easily accessed from inside without coming out. A swivel hitch with 1 and 7/8 ball makes the carrying seamless and it becomes difficult to understand if there is something right behind the motorcycle. The Kwik Kamp motorcycle camping trailers also have 14 feet of storage and can be easily accessed even without setting up the camp.